Making the switch to renewable energy is easier than ever before. The technologies behind existing ways to generate renewable energy have improved rapidly over the past couple of years, but we also have more options when it comes to renewable energy generation. What’s interesting is how today’s best solutions are not only available for business users and larger energy consumers, but also for home users. If you are thinking about making the switch to renewable energy, here are the three ways you can power your home today. Solar panels remain the most popular option on the market. The approach has been around for years, so it is not surprising to find the devices available today showing immense efficiency. Solar panels and the energy storage systems supporting them are perfect for home users. However, the development of solar panels didn’t stop there. The panels are being improved in many ways, making solar capable of generating energy from the sun without using gigantic panels like the old days. The result is solar shingles that you can now use as a regular roof shingles and a power generation system capable of producing more than what your house really needs. Solar power is used in other ways too. HVAC engineers in Chicago and other parts of the country are starting to use solar-powered air conditioning systems to control the interior climate of modern houses. Of course, solar water heaters are just as efficient, so the options are limitless indeed. Another interesting trend to follow when you are thinking about switching to renewable energy is hybrid systems. The systems are designed to rely on multiple methods of power generation, and one of them is wind turbines. Don’t picture huge towers with propellers the size of your SUV because wind turbines are now compact and very efficient. The technologies behind modern wind turbines have allowed them to become smaller while remaining highly capable. 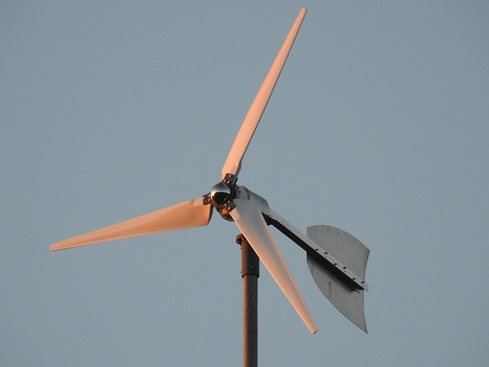 Wind turbines can be used on their own or as a part of the hybrid system mentioned earlier. The latter lets you combine wind and solar with capable batteries and efficient energy management. With the right system, you can sell electricity back to the grid and lower your energy bills even further. Geothermal as a source of home renewable energy may not be common, but there are plenty of systems that can derive energy from heat present below the earth’s surface. This option may not be for everyone – the efficiency level of geothermal energy depends on the geological conditions of your home – but it is an option worth considering nonetheless. Geothermal also comes with added benefits, including better durability, high capability of generating energy, and completely noise-free operation. You can also expect the geothermal power generator to be noticeably smaller than other options covered in this article. Regardless of the option you go for, you now have plenty of choices when it comes to generating renewable energy for your house. You can power your house with the generated energy and even sell some of the excess electricity back to the grid. Appear! 20 Of The Most Bizarre Houses In The Planet!